This just in – Sage Norton​ and Shannon Matthews​ have agreed to chair the competition committee, replacing Cassy Crouse​ and Chad Ahalt​ who have been doing this task for as long as I have been involved with the club. This will take place officially after the banquet. Congratulations to all the Steeplechaser members who participated in the MD Grand Prix Series. Special congratulations to Ruth Taylor​ (2nd place overall), Steve Dobson​ (1st place 50-54), Malcolm Senior (1st place 60-64), Bruce Attavian​ (1st place 65-69), Art Gregory​ (1st place 70-74). Results from the Goodloe Byron 10 Mile Run have been posted. 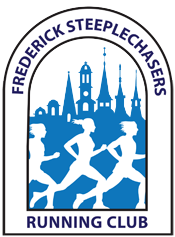 Results from the Emmitsburg Wattle Waddle 5 Mile Run have been posted.